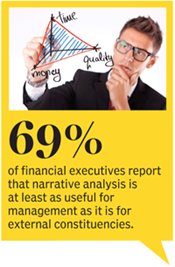 Why CFOs view narrative as a plus in financial reports. Numbers don’t lie. But do they always tell the complete truth? Even the most committed financial executives are now inclined to believe that numbers, no matter how neatly presented in everything from financial statements to annual reports, often aren’t as telling as they could be. What they need to accompany them — especially in an era of growing complexity and deepening detail — is language that can clarify and connect their meaning, making them more accessible. After all, financial statements are intended to serve as a form of communication with investors, employees, and other stakeholders. But beyond the chairman’s letter, say, financial reports can be too dense for many readers to untangle. To extract full value from the numbers, it helps to know more about the assumptions underlying them. Such revelations allow for comparisons, while also clarifying the drivers of performance and overall corporate strategy. Furthermore, finance executives recognize that the value of narrative discussions of financial results extends beyond investors, shareholders, and analysts. In fact, a large majority of survey respondents (85%) say that their own management benefits from the resulting process. In addition, 69% report that narrative analysis is at least as useful for management as it is for external constituencies. Weaving a narrative around the numbers is a time-consuming process. For most companies, the survey found, the effort can take up a good deal of both management’s and staff’s time. Nearly 9 out of 10 respondents say their companies spend at least a moderate amount of staff and management time preparing narrative portions of financial reports (see “Story Time,” below). Nearly all respondents, 86%, report that it takes them several days or more to collect and consolidate the data needed to fuel narrative discussions. Once the data is in hand, slightly more than 80% of respondents say they spend several more days analyzing the data and writing the narrative. The challenge boils down to identifying how and where narrative elements can serve the most beneficial purpose. Narrative analysis is best deployed, as one finance chief put it, when it discusses “issues that [the numbers] identify rather than the numbers themselves.” Creating the time for additional analysis often means finding ways to spend less time checking the numbers. To make sure there’s time for both activities, companies may have to improve the integration and standardization in their systems and processes. Nearly two-thirds of executives say that their companies must manually update narrative portions of their reports if any data points change (see “Manual Users,” below). Automating the financial close and reporting process provides significant benefits. Beyond improving time efficiency, automation also improves the accuracy and integrity of the data. More than 60% of respondents say that the number of handoffs involved in preparing financial reports significantly increases the risk of error. Those relying on spreadsheets are much more likely to say that the amount of time that management or staff spends on narrative analysis is substantial. Extensive use of spreadsheets also requires more iterations, which adds time to the process. The ultimate objective of these changes is, as one vice president of finance put it, to “streamline the time to collect [data] so management can spend more time analyzing and discussing.” Specifically, this requires making choices about which numbers are the most significant, because “the more we can sensitize stakeholders to the impact of our key metrics, the more aware they will become as opportunities to move the needle present themselves,” says the director of finance at a pharmaceuticals firm. That aim can be realized, of course, only if those who prepare the narrative have visibility into which factors are driving the results. While it helps if business-unit-level managers can provide more higher-quality analyses, the process also requires more involvement from top executives. One senior vice president calls for “more direct input from business leaders rather than [from] central units” preparing the narrative elements. That may sound impossible to achieve in an environment where finance executives feel overburdened by ever-increasing regulatory and legislative demands. But that, as they say, is a different story. Totally agree. I’ve been advocating the idea of narrative storytelling for some time now.